Champion Hurdle contender Zarkandar warmed up for next month's event with a dominant win in the Kingwell Hurdle. Zarkandar, who is second favourite for the race at the Cheltenham Festival, strode to victory in front of Khyber Kim (14-1) and Balder Success (20-1). The Paul Nicholls-trained horse was odds on (1-3) at Wincanton and jockey Daryl Jacob bided his time before easing ahead in the back straight. Zarkandar has now won seven of nine starts over hurdles in his career. Monte Cavallo set the early pace with Celestial Halo in his slipstream before Zarkandar moved up with three fences to go. The six-year-old came under little pressure and took the spoils by four and a half lengths from the Nicky Henderson-trained 11-year-old. The Kingwell Hurdle was Zarkandar's final event before the Champion Hurdle, and victory maintained his 100% record this season. Nicholls said: "[It was a] proper job that, I'm relaxed now that we've done well in the big trials today. "I was pleased with both horses and Celestial Halo [fourth] also ran great race and will go for the World Hurdle. "The great thing about Zarkandar is that you wouldn't know how much more there is in the tank. "It's an open race this year but we know the Cheltenham hill suits him." While Zarkandar was in effortless form ahead of Cheltenham, it was a different story for Ryanair Chase favourite Cue Card who had a stumble to thank from challenger Captain Chris as he eventually took the Betfair Chase. After setting much of the running at Ascot, Cue Card (15-8) looked set to be usurped by Philip Hobbs's mount before he narrowly avoided a fall after failing to fully clear the penultimate jump. Buoyed by the reprieve, jockey Joe Tizzard raced clear by six-lengths at the finishing post to claim the horse's first Grade One win over fences ahead of Cue Card (11-4) and Ghizao (12-1). "I saved a bit on him and bar one fence, he went really well," Tizzard said. "He looks worse than he feels as he uses himself well and makes a good shape; I have ridden a lot worse. 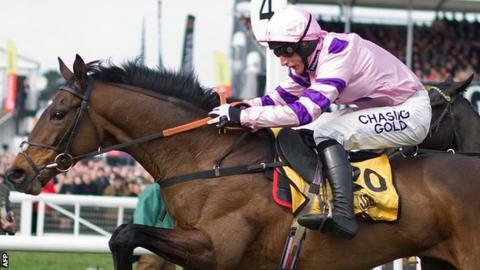 "Unless something crazy happens it is now the plan to ride the Ryanair Chase." Earlier, Well Refreshed overcame a bad mistake at the final fence to charge to victory in the Grand National Trial. After a slow start, the 9-2 favourite looked on course for a simple win, but made a big hole in the last hurdle. Jockey Josh Moore ensured the nine-year-old lost no momentum, however, and he galloped clear by 10 lengths at Haydock Park ahead of Rigadin de Beauchene (6-1) and Monbeg Dude (8-1).